Be Prepared for Your Interview: Techniques Used by the Interviewer - Southeast KANSASWORKS, Inc.
Not everyone is a skilled interviewer. You may find yourself in an interview where the employer is unprepared or seems unsure of what questions to ask. In this case, you will have to do your best to keep the interview focused on your interests and abilities and to find out what you need to know about the position being offered. If you are well-prepared, and you know what you want to communicate, you cna use a non-directed interview to your advantage by communicating exactly what you want and avoiding topics that might not cast you in a favorable light. In this type of interview, you will be asked questions about how you acted in a specific situation. Questions might include: Describe a situation where you had to resolve a conflict or Describe a situation where you used creativity to solve a problem. 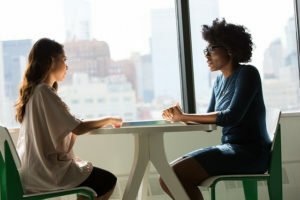 In these interivews, the interviewer is looking for responsises that demonstrat a specific skill that is used on the job. You may also be asked to describe a situation where you were not successful in solving a problem and what you did about it. Here the interviewer is looking for evidence of accountability and the ability to learn form mistakes. Prepare for this type of interview by taking each task that the job will entail and identify ing a situation in which you performed that task.